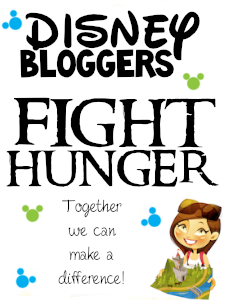 Picturing Disney: Help Disney Bloggers Fight Hunger!! In my normal day to day life I feel so grateful the only saying the would properly suit is "my cup runneth over". From the moment I wake up at 5:30 and get ready for work at a job I love, a job that is never work to me, I am happy. When I say good morning to my amazing husband who surprises me and inspires me every day, my heart is filled with love. And when I talk to my healthy and happy family and friends my life feels like I hit the lottery. I sometimes find myself overwhelmed with the weight of time on my shoulders and it all comes down to the feeling that I have SO much while others have to live with so little. And so I give back. I donate as much as I can whenever I can. I donate my money and my time. I create things from my hobbies and give things away- on my blog here alone I have had 30 giveaways just to say thank you! Now I am here asking you to give back- whatever you can. Why? Because there are people in our country who can not afford to eat and food is not only a basic need but it is something, all politics aside, everyone has a right to. No one should go hungry in America and when I hear stories about families who are living without while I am making ADRs for my next Disney World trip I feel like the least I could do is donate. Because of Feeding America's connection with food banks across the nation a $1 donation could provide 8 meals! EIGHT! You could provide meals for a week for less than a cup of coffee. I urge you to join our cause and donate what you can, no matter how big or small. Buy store brand, rent a movie instead of purchasing it, make a PB&J instead of buying lunch or skip Dunkin Donuts just once, and help us Feed America. Every little bit counts. And we have ALREADY MADE $500! We are halfway to our goal!! !